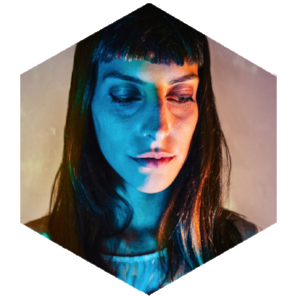 Moon Ribas is a Catalan avant-garde artist and cyborg activist best known for developing a 6th sense that she calls the Seismic Sense: whereby a seismic sensor has been implanted in her arm allowing her to perceive earthquakes through vibrations in real time. Depending on the scale of an earthquake on the Richter scale, she'll get a weaker or stronger vibration as a way to sense what she calls "the heartbeat of our planet." In order to share her experience, she then translates this sense on stage. In 2016 she added another sense by connecting her feet to the seismic activity on the moon in real time. Ribas believes that by extending our senses to perceive outside the planet, we can all become ‘senstronauts’. In 2010 she co-founded the Cyborg Foundation, an international organisation that aims to help people become cyborgs, defend cyborg rights and promote cyborgism as an artistic and social movement.